This page covers LTE Advanced UE category parameters including downlink and uplink parameters viz. DL-SCH, UL-SCH, data rate etc. It covers LTE Advanced UE category-6 (i.e. cat6), category-7 (cat7), category-8 (cat8), category-9 (cat9), category-10 (cat10), category-11 (cat11) and category-12 (cat12). 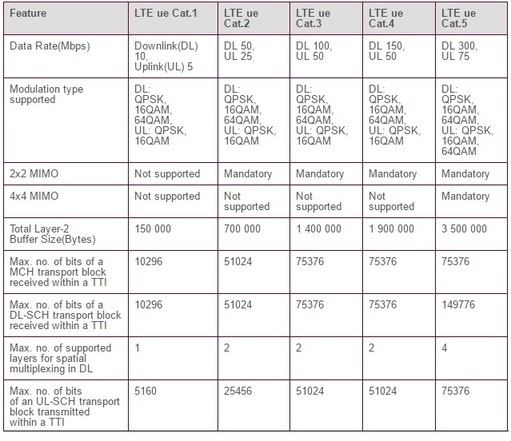 Following table mentions LTE Advanced UE categories including Category-6, Category-7 and Category-8. In the table, DL stands for Downlink (from eNB to UE) and UL stands for Uplink (from UE to eNB). Following table mentions LTE-A category 9, cat.10, cat.11 and cat.12.